After an enormous harvest of lettuce, so much I had to turn on the other fridge, it’s now the dog days of summer and I guess you could say we’ve hit a dry spell in both rain and harvest. Just when I thought I finally had all the pests there ever could be under control, a new one arrives. This time it’s the deer, well a family of deer actually. The mama, papa and baby seem to have found our block a rather nice campground. It’s shocking to look up and see a large buck casually passing through when just across the street lies a very busy and congested urban center with all its buses, traffic, congestion and buildings. Not at all the kind of place you’d expect to see large forest animals. But I guess this is the price we pay for trying to integrate natural areas with urban ones. I’ll take this as I’m doing a good job. So I found a couple websites describing a cheap way to make a deer fence out of fishing line and I’m looking forward to giving a try. I will put it up in addition to the existing rabbit fence. Actually the deer haven’t bothered the tomatoes and peppers since I put up tomato cages and they didn’t really damage the chard, beets and beans until I weeded so I’m wondering if the weeds aren’t always such a bad thing. Speaking of weeds, I’ve run into quite a few interesting ones. 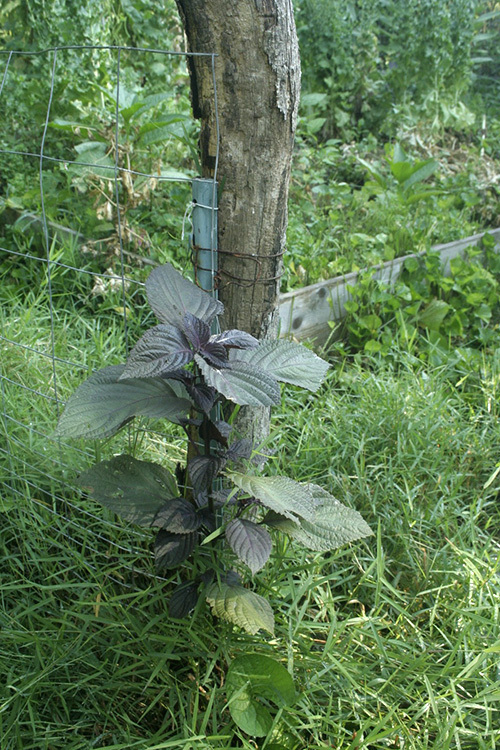 I’m pretty sure this is bitter nightshade also known as climbing nightshade (Solanum dulcamara). It is not native and according to Go Botany, invasive. Also all parts of the plant are toxic. 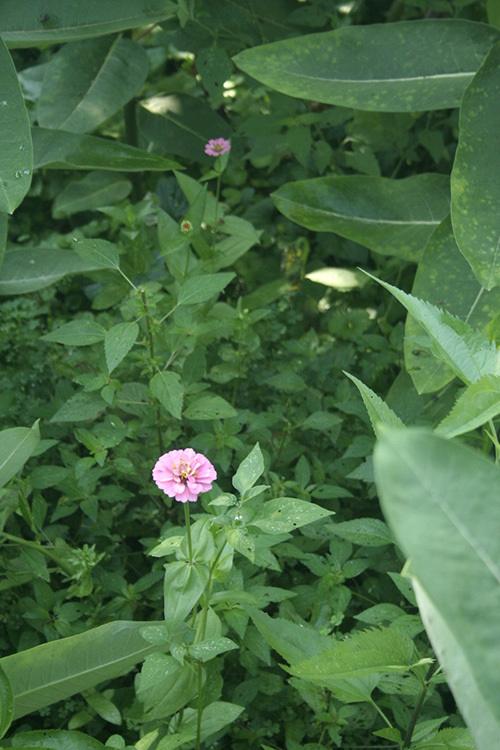 But according to Illinois Wildflowers, it does have wildlife value and prefers disturbed areas to natural ones. 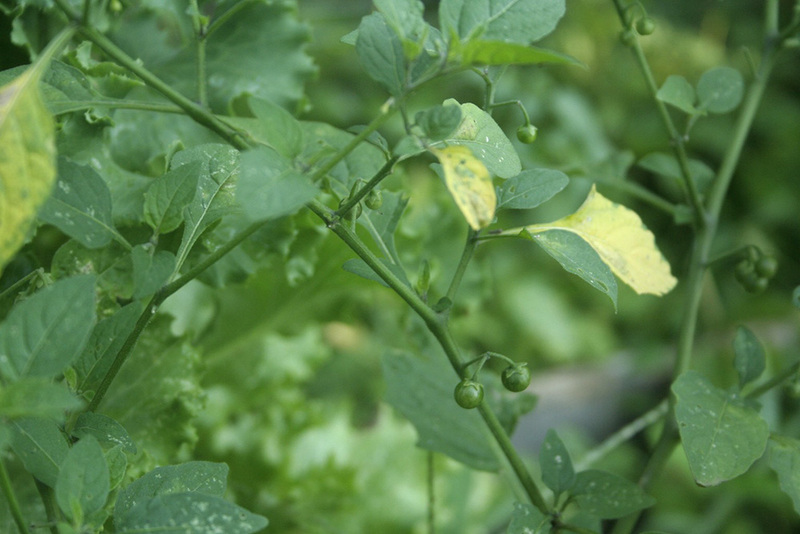 This one is some kind of ground cherry and is related to the tomatillo. Both have fruit with these cool husks. 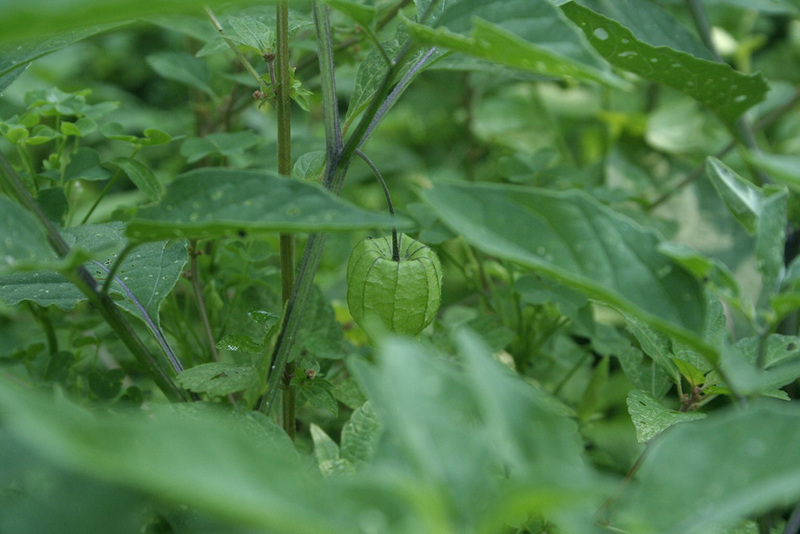 There are several different variations but I’m guessing this one’s probably clammy ground cherry (Physalis heterophylla) which is both native and non-native. This plant sneakily grew right next to the other pepper plants I planted (they are in the same family and look very similar) so I unknowingly watered it until I realized it was an imposter. But as the fruit is edible, I may as well. While often labeled a weed, I don’t think it’s invasive. Lambsquarter snacked on by my deer family. 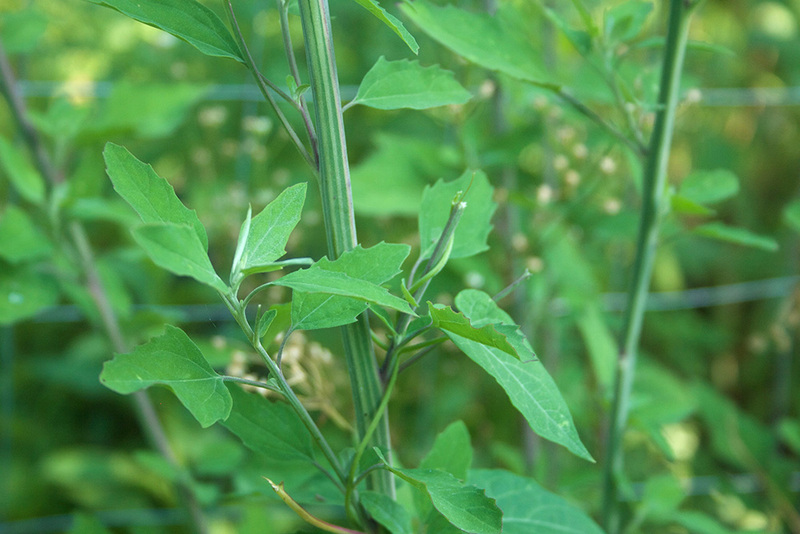 And here is the edible and very nutritious lambsquarter (Chenopodium album). This lovely plant is shiso (Perilla frutescens), an herb in the mint family used frequently in Japanese cooking. In my seed collecting expeditions last year, I must have picked up a few seeds accidentally. I say accidentally because I later found out they are invasive. Bummer. I think I’ll try cooking them before they go to seed instead of pulling them. Rhomboid mercury covers ground and supports wildlife. And then there’s this one known as rhomboid mercury or rhombic copperleaf (Acalpha rhomboid) which in my opinion doesn’t make a half bad ground cover. It isn’t edible but is native and does have wildlife value so I really don’t mind it. 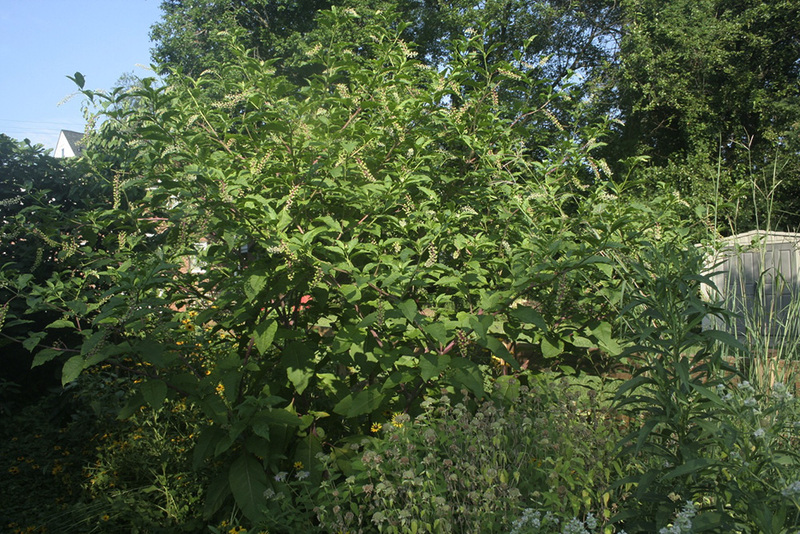 Which has me somewhat in a tizzy as many of the plants in my garden are not that native by any degree. And this fact combined with that other dreadful study has me thinking that maybe the best way to truly be an ecologically correct gardener is to NOT plant anything at all but instead manage things to control the not so good plants that volunteer and let the rest do what it may. All I can say is I sure am glad I don’t live in one of those uptight HOA communities. And what about human food? Most of that isn’t native by any means. But enough of that. 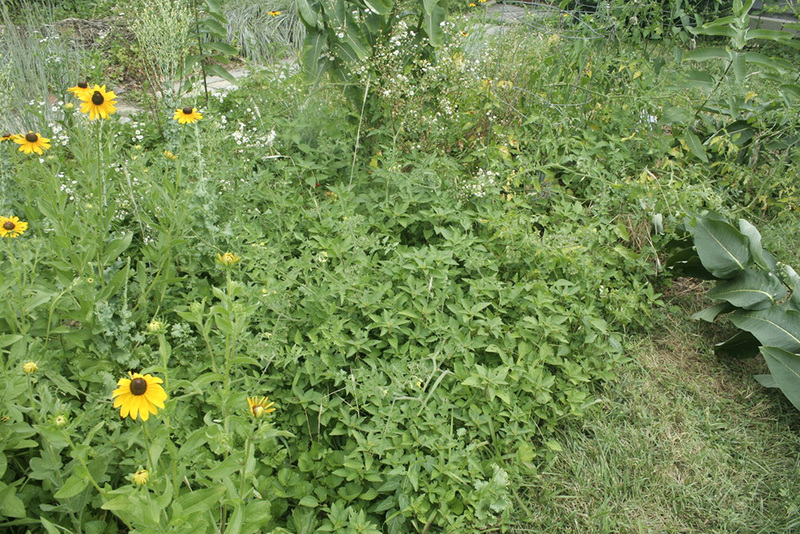 Speaking of not so native, the front yard meadow is finally not looking too bad. 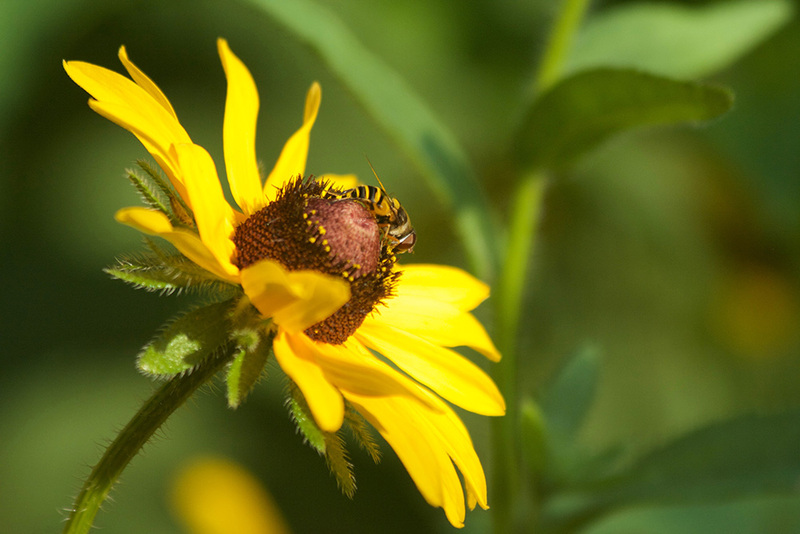 The black eyed Susan (Rudbeckia hirta) (North Carolina ecotype) has bloomed in the first year attracting interesting bees. 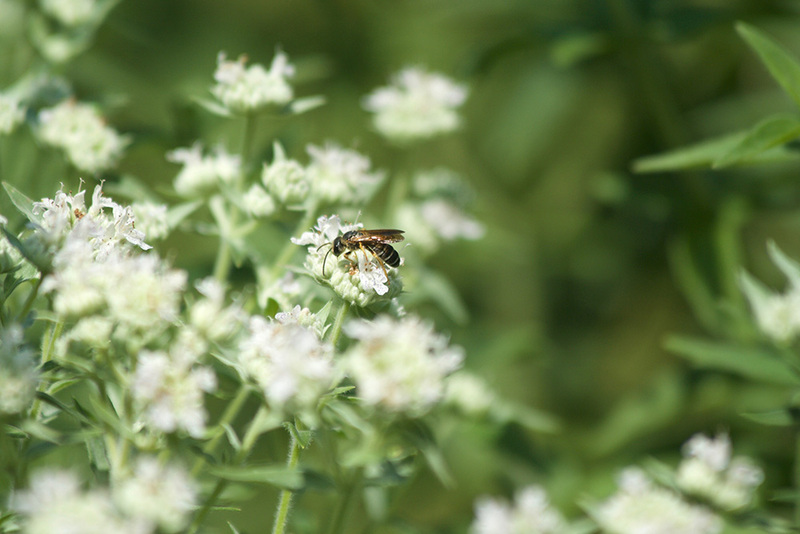 And the hairy mountain mint (Pycnanthemum verticillatum var. pilosum) finally bloomed and is also attracting different bees. I should add this an excellent mint for a gin and tonic. On the other hand the very native pokeweed is grand. 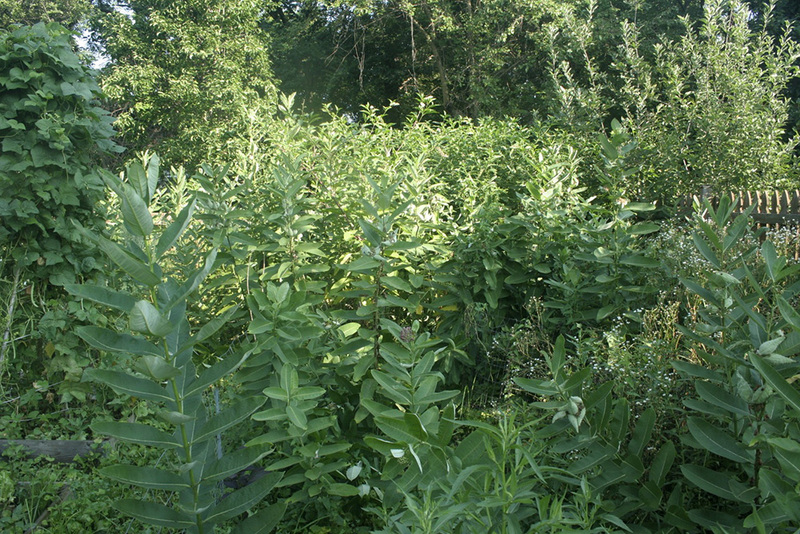 Common milkweed and pokeweed jungle. My original plan to temporarily fill spaces with pretty and non threatening annuals didn’t quite work out as planned. They seemed to be outnumbered by the “weedier” milkweed, pokeweed, nightshade, rhomboid, ground cherry, violets, Virginia creeper, nimblewill, ground ivy, white avens, white snakeroot, fleabane, sneezeweed and black eyed Susan. There is no room for the weak or delicate in my garden. But as it turns out, (most of) what I’ve got might not be so bad.